This easy little hike has a lot of bang for the buck. The trail head is long Forest Road 8420, and begins an immediate and rather steep ascent toward Cora Lake. However, the trail is gentle most of the way with adequate switchbacks. 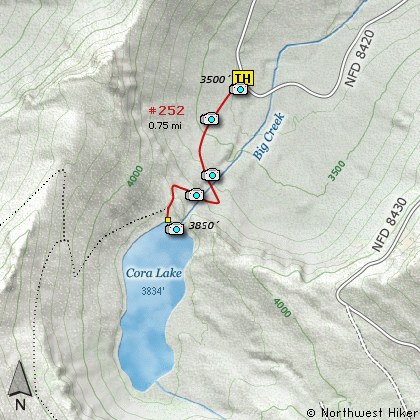 The biggest challenge to this hike is the stream that flows out of Cora Lake. You have to cross this stream twice. In the spring, this can be quite a challenge if you don't want to get wet. Otherwise, no big deal. Cora Lake is a real gem. It is surrounded on the southwest side by High Rock Peak which towers over 1800 feet above the lake. You can see the lookout on the peak as a little white dot. And as Hike 5 points out, you can see Cora Lake from the peak as a beautiful emerald lake nestled in the forest below. 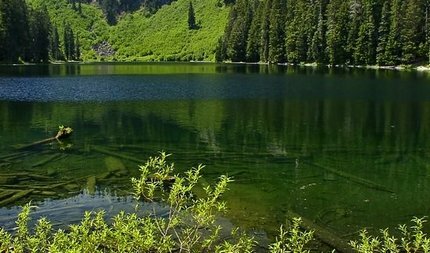 Cora Lake is great as a family hike. The little stream coming out of the lake is the only concern. The hike is short with not much elevation gain. There is a fine place for a picnic when you reach the lake. From the junction of SR512 and SR161 in Puyallup to the junction of SR161 and SR7 in Elbe is about 36 miles. Then traveling east on SR161 it is about 8 miles to Ashford. Follow SR7 north out of Morton for about 16 miles to the junction of SR161 in Elbe. Turn right onto SR161 and travel about 8 miles east to Ashford. From Ashford travel east on highway 706 for about 2.3 miles. Turn right (south) onto Kernahan Rd East which will become Skate Creek Road. This road is also designated as Forest Road 52. Follow FR52 for about 4.7 miles and you will come to the junction with Forest Road 84. Turn right (south) onto FR84 and follow it for about 1.4 miles until you come to Forest Road 8410. Continue on FR84 for another 2.8 miles and you will come to Forest Road 8420. Bear right on FR8420 and follow it for about 1.6 miles, where you will find the trailhead for this hike on your left just after crossing Big Creek.